This Post is a quick look at some book and theme displays that we created this year. 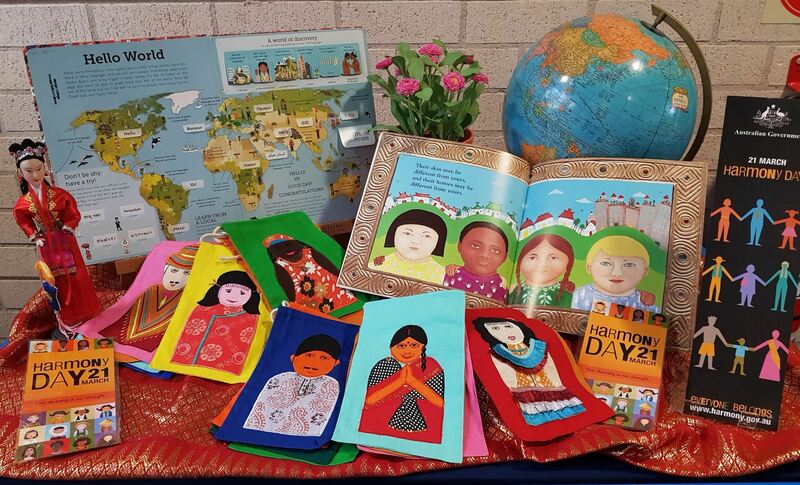 As you can see selecting a few books and items can create an inspiring display to promote a theme such as the Year of the Dog, highlight an event such as the World Cup, or focus on a topic. 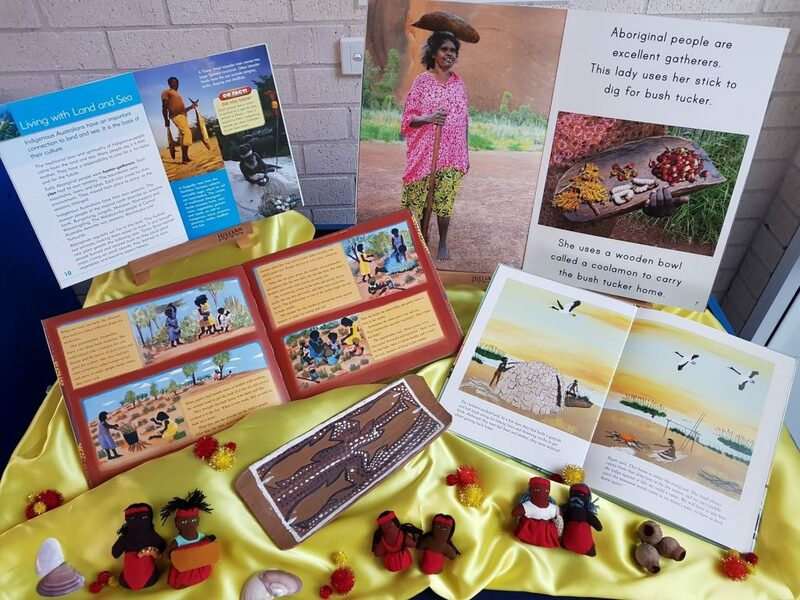 During the week we set up our library displays for National Reconciliation Week, 27 May – 3 June 2018. This year we also created a display for the school reception. Sourcing the information and artworks for the displays is always a stimulating experience. Our workbench was covered in texts and illustrations until we linked the pieces together to create a theme and exhibit an outstanding range of resources. 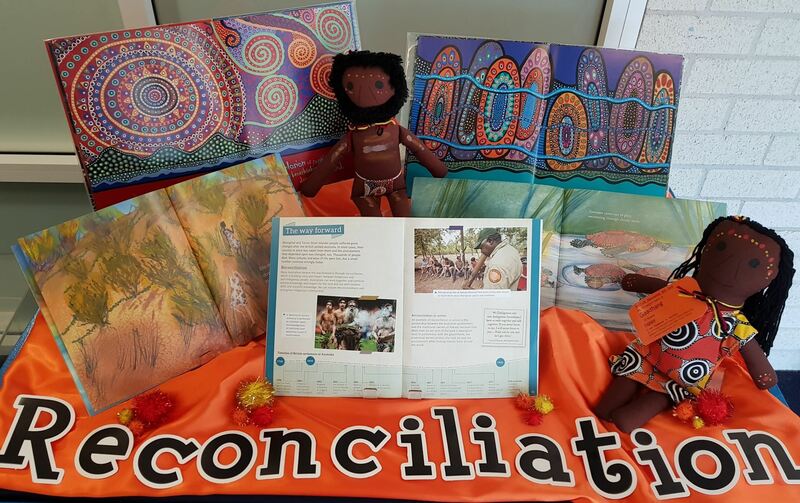 Reconciliation historical theme featuring a timeline and background information from the Macmillan history resource book Indigenous Australians before and after British settlement. 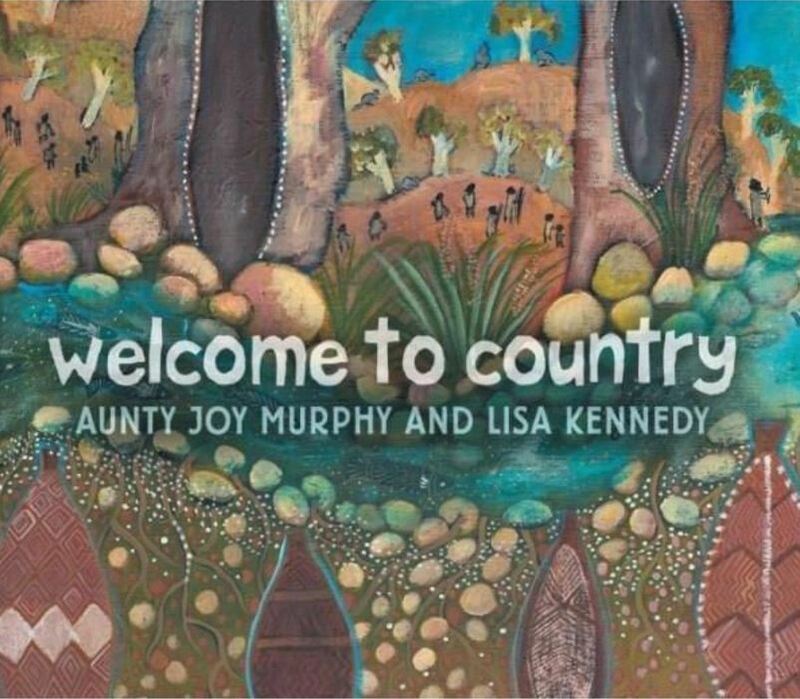 Stunning artwork by Bronwyn Bancroft Colours of Australia and Shapes of Australia; The Toast Tree by Corina Martin and Big Fella Rain by Beryl Webber both illustrated by Fern Martins and published by Magabala Books; an Aboriginal girl and Aboriginal Warrior doll. Art and storytelling displaying artworks from my personal collection, Animals around the Billabong by Mike Ingram, and Macmillian’s Year 4 History Anthology How People, Places and Environments Interact. 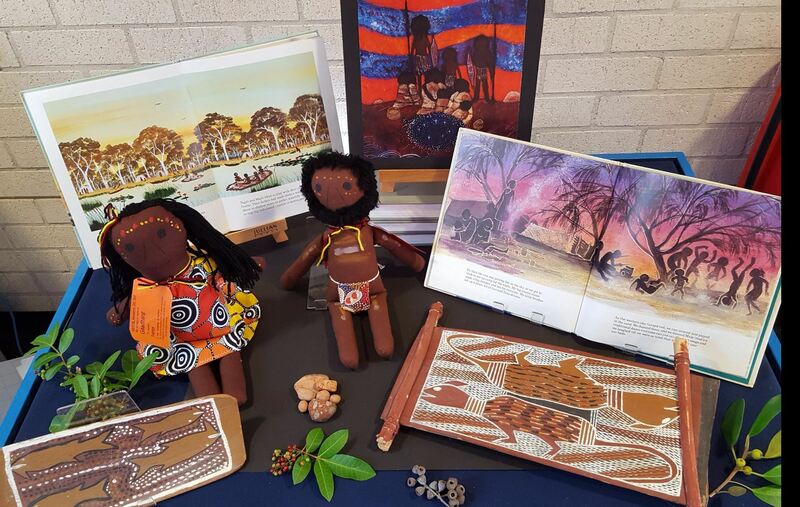 Land and sea display showcasing First Australians by Carolyn Tate; Let’s Learn about Bush Tucker by Matthew Ingram; When I was little, like you by Mary Malbunka; Children of the Great Lake by Percy Trezise; a bark painting, and a traditional Aboriginal family doll set. 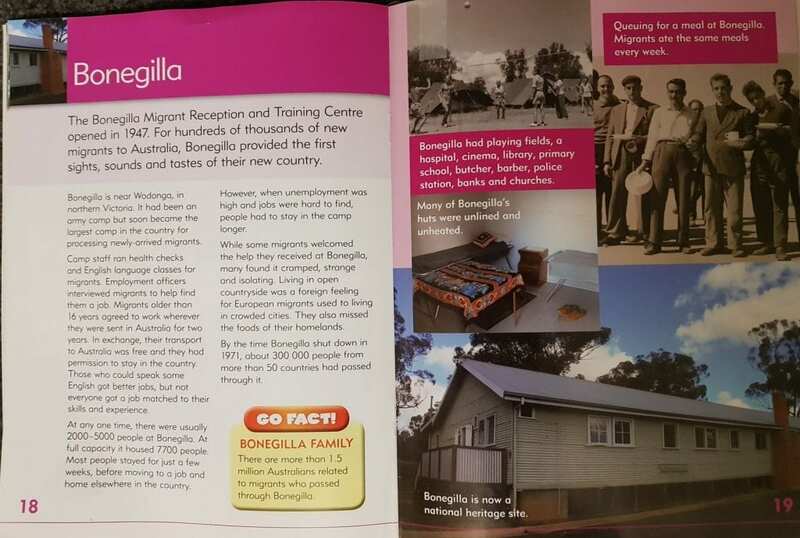 For information about National Reconciliation Week, a visit to the official website is a must. Whoever You Are. by Mem Fox. Hello World! A Celebration of Languages and Curiosities by Jonathan Litton. The Tale of Peter Rabbit was first published in 1901, Beatrix Potter self-published and printed 250 copies. Over the years Peter Rabbit has been read, shared and loved by so many children, parents and grandparents alike. In 2016 a first edition of The Tale of Peter Rabbit sold at auction for £43,000! 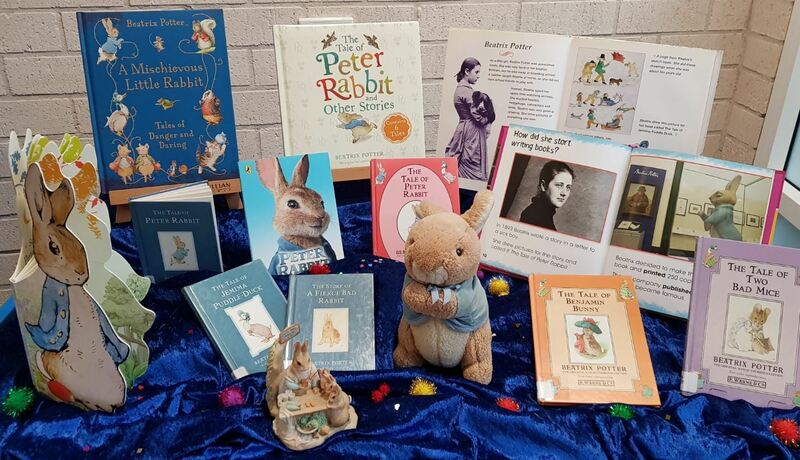 The Peter Rabbit library display features my son’s Peter Rabbit soft toy (now 18 years old), a Bunnykins sculpture that was given to me by a wonderful teacher I previously worked with, author profile books, and newly released Beatrix Potter books. It is always a pleasure to see children enter the library, stand close taking time to admire the displays. As the final days of the school year wrap up it is great to look back and reflect. It has been a busy but productive year, and we have worked tirelessly in the past weeks revamping the library collection, reorganising shelving and running a stocktake of the fiction books – it will be a fresh start next year! 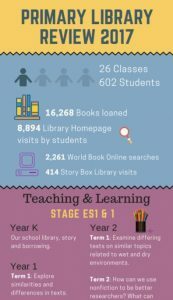 I would like to acknowledge and thank the support and commitment of the library team and teacher librarian who taught the Year 6 classes. The review is a snapshot of teaching and learning, special events, loans, resource use and top books loaned. What worked well, what requires change and improvement is in mind, but rest first is required. PS I used www.canva.com to create the Infographic. 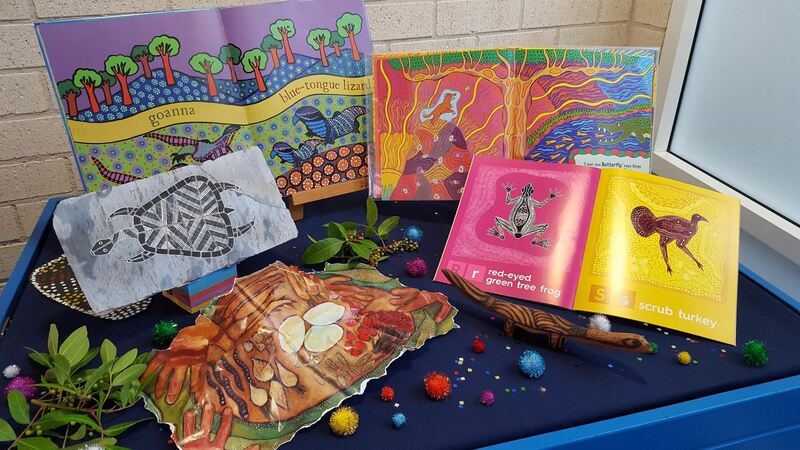 It was wonderful to create the new library displays to commemorate National Reconciliation Week. 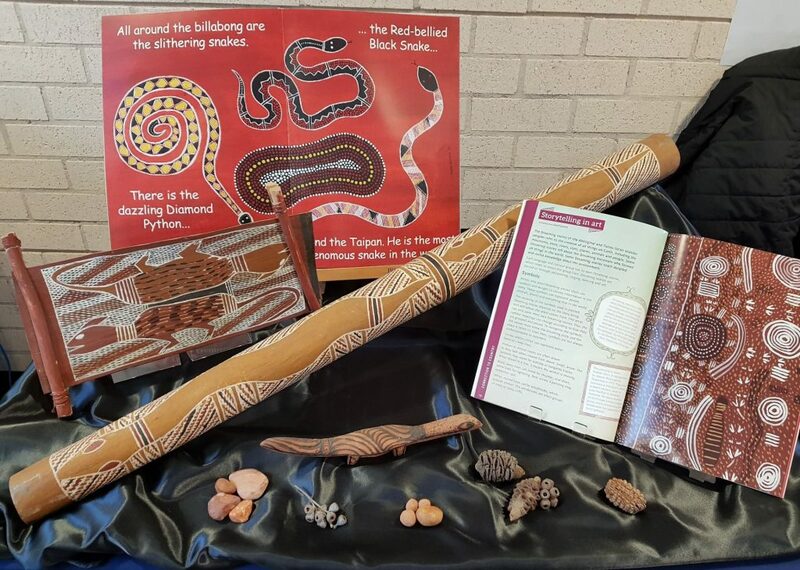 This year we have two displays – one focusing on animals and the beautiful colourful artworks in a selection of children’s picture books, a wooden lizard from Uluru and a turtle painted on stone. The other display represents family highlighting children and traditional artworks on bark from my personal collection. Say Yes: A story of friendship, fairness and a vote for hope by Jennifer Castles, and illustrations by Paul Seden. 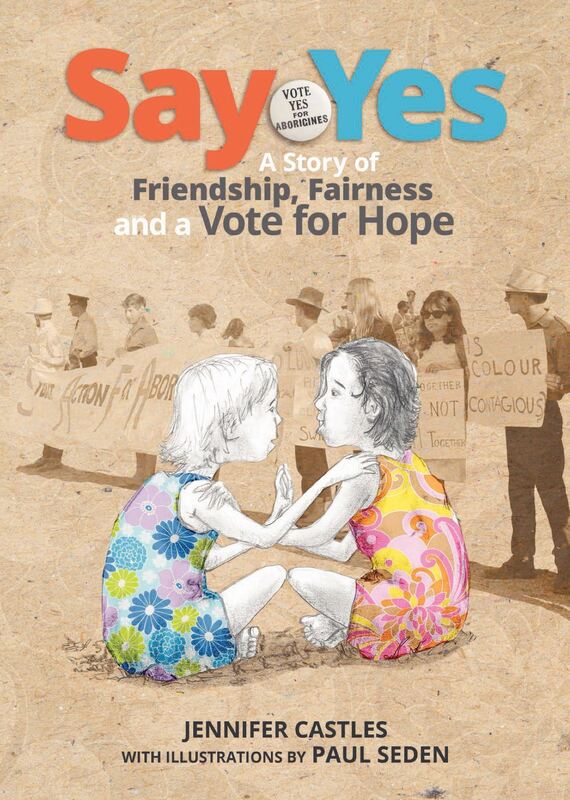 This picture book sensitively captures the 1967 Referendum in way that enables historical issues and perspectives to be shared with children. 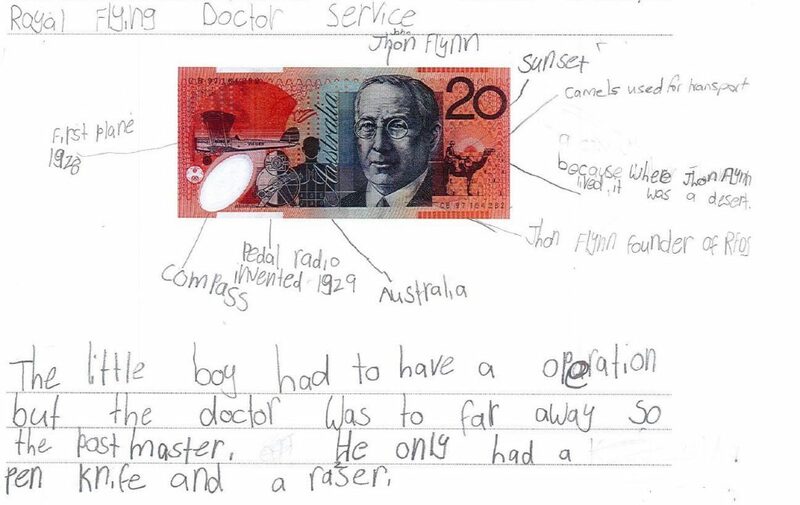 The Allen & Unwin site provide teaching notes and Reading Time has a superb review, the suggested reading age is 7-12. 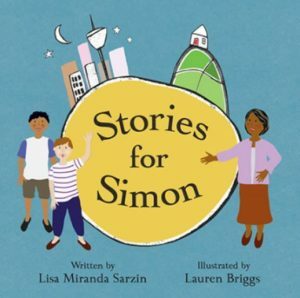 Stories for Simon by Lisa Sarzin and Lauren Briggs, a moving and beautifully illustrated picture book that helps explain the Stolen Generations to younger students. The Stories for Simon website provides background material about the story and links to Teachers’ Resource notes. 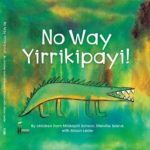 The illustrator Lauren Briggs has visited our school on sharing the story with primary students and art workshops with high school students. 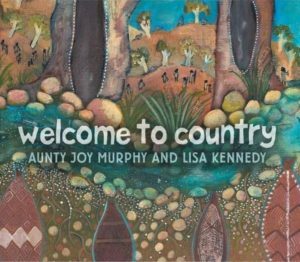 Welcome to Country written by Joy Murphy and illustrated by Lisa Kennedy is an outstanding picture book portraying personal traditions of Aboriginal people allowing for teaching and learning of understanding and respect for Aboriginal culture. 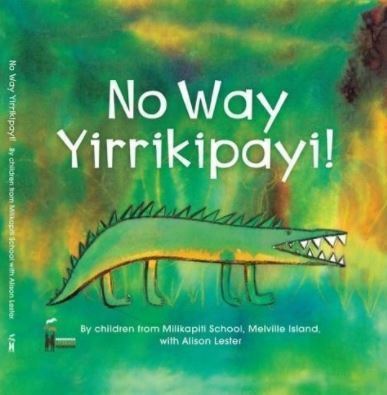 Walker Books have provided extensive Teacher Notes for this book and a reference to a wide range of resources including picture books with Aboriginal themes, nonfiction books for younger and older readers, websites and video links. 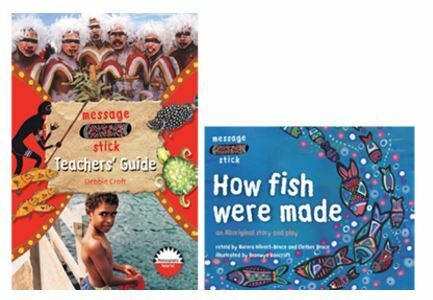 The Message Stick book series published by Nelson Cengage are a wonderful series of books offering Dreaming stories with short plays such as How the Murray River was made and informative books on fishing, hunting and gathering, and bush tucker. The illustrations and photos are highly appealing and informative and text at a level suitable for lower grades. The series also includes a Teacher Resource book. Lizard, stone and bark artworks from my personal collection. 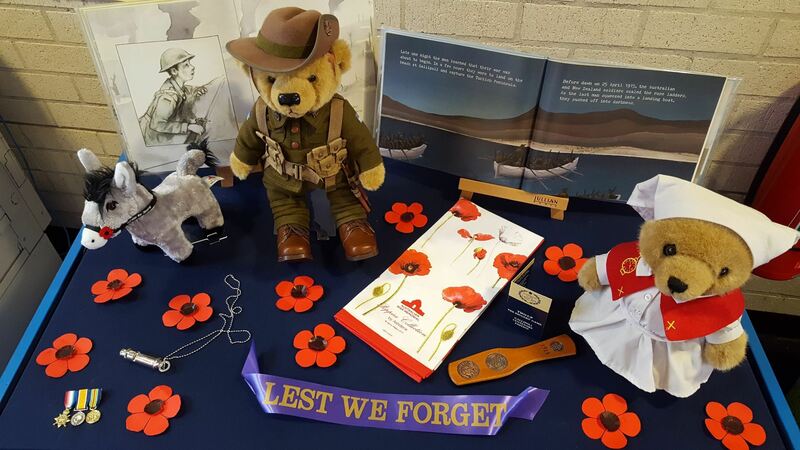 Information about the Commemoration and Educational resources and activities are provided by the Australian War Memorial. 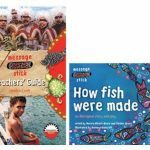 The Primary English Teaching Association Australia also provides Lest We Forget which comprises six literature-based units of work for PETAA members. 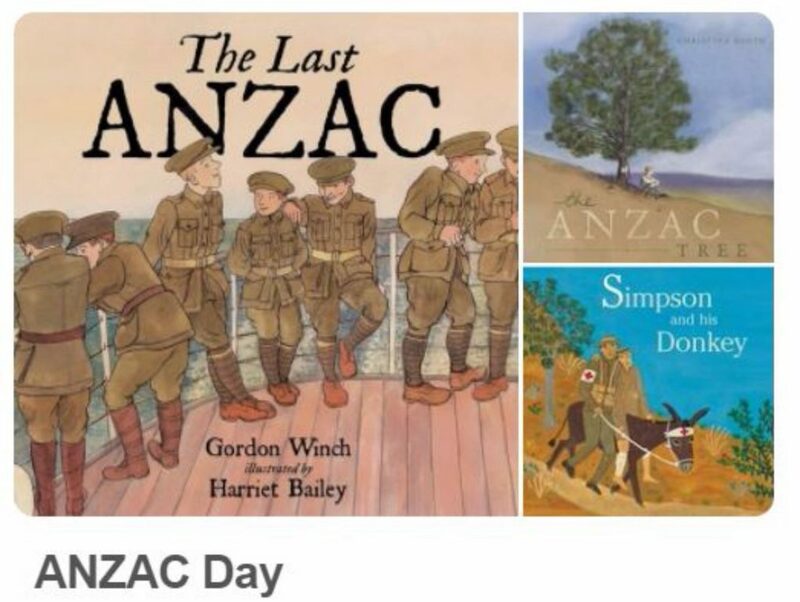 A collection picture books, some with teaching notes are available via my Pinterest collection of ANZAC Day commemoration picture books.